Product prices and availability are accurate as of 2019-04-21 00:48:05 EDT and are subject to change. Any price and availability information displayed on http://www.amazon.com/ at the time of purchase will apply to the purchase of this product. 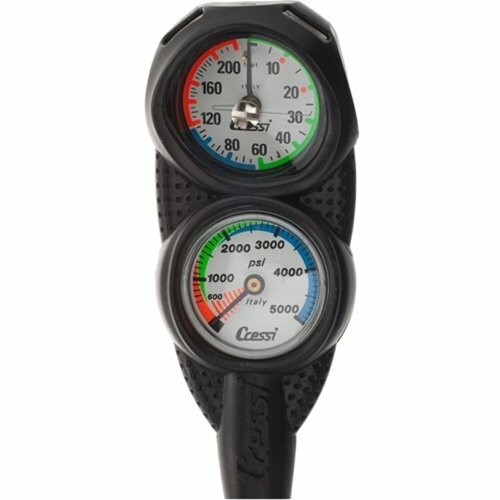 Miniconsole 2 is a small console that houses the Cressi mini pressure gauge and a new, small, analogical depth gauge. It is a high quality instrument with a metal case and membrane functioning and has a large parabolic scale. On the luminescent face the first 12 metres, which correspond to the area of decompression stops, are spaced out and perfectly legible. The end scale is at 70 metres (or 230 feet in the imperial version) and the face is divided into three different coloured zones: green up to 20 metres, light blue from 20 to 40 metres, red from 40 metres to the end of the scale. The instrument has a maximum depth indicator that blocks on the maximum depth reached during the dive. The pressure and depth gauges are positioned in such a way that both instruments can be read quickly and easily in any conditions. At the end of the console, slightly to the sides, there are two loops for fastening the instrument to the jacket so that it does not hang down with the risk of catching and damaging the environment.